Stanbridge College’s Master of Science in Occupational Therapy (OT) graduate students collaborated in a partnership with the Wounded American Veterans Experience Scuba (WAVES) project to help veterans with PTSD and other combat injuries maximize independence and overcome anxiety through ocean therapy. WAVES is a non-profit organization that provides American veterans facing PTSD, brain trauma, spinal cord injuries, as well as double and triple amputees with the opportunity to experience the therapeutic benefits of scuba diving. The open water dives facilitated by WAVES exposes veterans to the calming effects of underwater environments. The reduced effect of gravity underwater while diving offers the disabled veterans a relief from impairment and renders them equal to able-bodied divers. 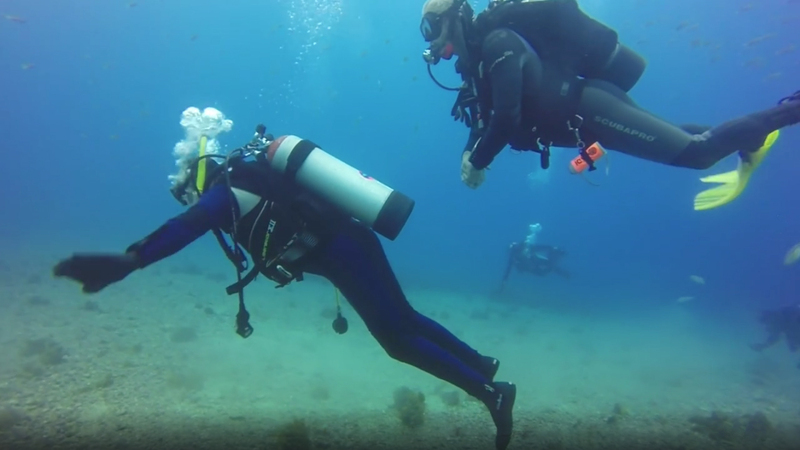 Five of Stanbridge College’s graduate OT students traveled to Catalina Island off the coast of Orange County, California, to help scuba instructors and veterans in an open water dive. While assisting WAVES instructors, the OT students helped veterans don their wetsuits and scuba gear, and also assisted in helping them both in and out of the water. Students utilized clinical reasoning and Occupational Therapy knowledge to enhance the performance and wellness of the veterans in an underwater environment. “Working with the Stanbridge College students was great. They were very enthusiastic about the WAVES project and came away with a powerful sense of how we all need to reach out to our veterans,” said Captain Ron Fonstad, instructor at the WAVES Project. After the dive, Stanbridge College students constructed a proactive plan to help the veterans better manage their surroundings and stress levels during future dives. Their research and activity plan was also shared with the WAVES project to further educate the instructors, as well as the veterans and their families. The plan serves as an additional tool to enhance the performance and wellness of the veterans while exploring an underwater environment, and support them as they strive toward their personal goals. As a part of their Master’s degree education at Stanbridge College, OT students work alongside experienced faculty advisors to create a community-based research thesis. The work produced focuses on how OT can uplift both local and global communities in need. Graduate students have produced research in partnership with Fordham University offering insight into the occupational challenges astronauts encounter during deep space exploration in preparation for the Mission to Mars. Additional research projects conducted by the Stanbridge College OT students include occupational procedures to help the elderly in need of driving assistance, exploring methods of advocating refugee wellness, promoting sexual education among women with spinal cord injuries, and planning safe OT environments for the LGBT community. To learn more about the programs at Stanbridge College and its degree programs, please visit www.stanbridge.edu. For more information regarding our Master of Science in Occupational Therapy program, visit here. To learn more about the WAVES project, visit their website.